Glasgow is the first airport in the country to benefit from the NATS Contour Mapping Solution, a new world-beating safety enhancement developed by NATS, the UK’s leading provider of air traffic services and solutions. NATS engineers have used NASA satellite data, which provides a three-dimensional map of the terrain around Glasgow Airport, to create the world’s most accurate model for testing unsafe altitudes. As a result, air traffic controllers can now test flight paths to an even higher level of precision, ensuring aircraft maintain a minimum safe distance from the ground. NATS Senior Systems Engineer, Andrew Wood, explains: “The NATS Contour Mapping Solution is the first system in theUKto use 3D terrain mapping in a live operational environment. The project began in 2009 following talks between NATS and the Civil Aviation Authority’s (CAA) Safety Regulation Group. Both organisations then worked together to identify ways to provide viable altitude warnings at airfields in mountainous areas. 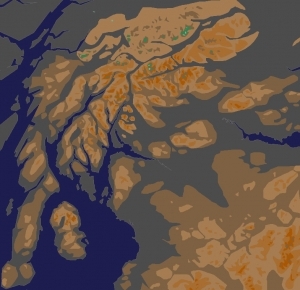 The team converted NASA data into contour maps that would work with the systems at Glasgow Airport, with approximately 24,000 contour points, or 1,340 polygons, representing different locations and heights above sea level. This was then extensively tested prior to operational use. Andrew says: “The system has been verified to trigger when aircraft are either entering a dangerous rate of descent or are in close proximity to the ground. Now, after a successful six-month trial, the safety-net system with the enhanced terrain model is a permanent part of the Glasgow operation. NATS now plans to roll out the NATS Contour Mapping Solution to other airports across the UK.